as published by Inside Jersey. Congratulations! 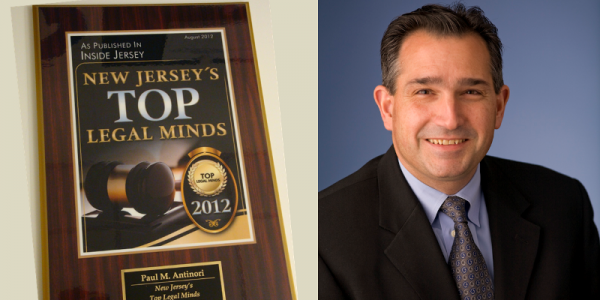 Paul M. Antinori, J.D. is the General Counsel of The Medicines Company, since May 2002 and has been a Vice President since August 2004. From March 1998 to April 2002, Mr. Antinori was General Counsel and a consultant to Physician Computer Network, Inc., a healthcare information technology company. Prior to March 1998, Mr. Antinori was a partner at Gibbons, Del Deo, Dolan, Griffinger & Vecchione in Newark, New Jersey. Mr. Antinori received his J.D. from the University of Virginia School of Law and his B.A. from Boston College. Is it again, the Summer of Paul? I want to unleash a few good snaps, but I don’t want to diminish Paulie being honored. I’ll have to think on this for a bit. Congratulations Paulie! Oh yeah… nice picture! I’d buy a used car from that man.